May 4 2017 - On Tuesday, The Daily Star and IPDC Finance Limited jointly presented the “Unsung Women Nation Builders Awards” to seven exceptional women at the Krishibid Institution. 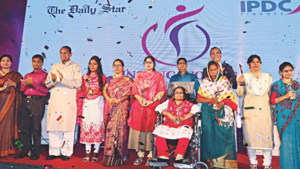 These women were awarded for their courage, persistence, generosity and hard work and for their immense contributions to Bangladesh’s socio-economic development. The awards – a crest and a cheque of Tk 2 lakh – were given out to each of the awardees in the categories of child rights, agriculture, law enforcement, education, entrepreneurship and health. Each of these women has shown incredible resilience and braved all odds to fight for social justice. Some of these women have personal struggles of their own such as a physical disability or financial constraints despite which they were able to make a difference in their communities. Irani Baroi, who has been paralysed from the waist down for two decades, is now a senior nurse at a general hospital in Madaripur. Rokeya Begum, despite being blind, is a successful educationist who teaches at a government primary school. Sonajan Akter has been serving as a midwife free of cost – despite hailing from a poor family – in her village and in fifteen others for the past 50 years. The stories of the four other women are just as awe-inspiring. In a society where women face innumerable hurdles such as sexual harassment, discrimination and forced early marriage, the feats accomplished by these women are nothing short of remarkable. They serve as a role model for us all. We hope that more such people, whether it be a man or a woman, who are silently and selflessly serving their communities, are recognised for their contributions to build a better, more prosperous Bangladesh.